This is part 7 of a multi-part series on hamstring pulls and rehabilitation. By the beginning of the second week post-injury, we had made significant improvements. Continuing along with the iterative process of performing running drills and accelerations, along with constant manual therapy, we were able to effect big improvements from day to day. Warm-up would include light jogging, dynamic flexibility and PNF work around the hips, and light, flushing massage throughout the lower extremities. Accelerations have gone from 10 meters in the first week, to 20-25 meters in the second week. In between sets, we are continuing to perform massage on the hamstrings, calves and glutes to ensure they are available for recruitment, and that any kinetic chain disruptions are minimized. I have found that hamstring rehabilitation is primarily about restoring proper intra- and inter-muscle coordination. When a hamstring is injured, the involved and surrounding muscles tend to seize up and minimize range of motion in a protective response. The massage repetitions we are performing help to reduce spasticity and enhance circulation in the region, while the acceleration reps and drills help to re-activate and re-educate the hamstrings and connected muscles (glutes, calves, hip flexors) to recruit in proper amounts and the proper sequence. I am a firm believer that if you free up the muscles to do their proper job, the appropriate sequence of movement will return. While many individuals will say that the prescription requires strengthening protocols, I would go much further to say that an appropriate coordination pattern must be restored. Obviously strengthening is part of the process, but it is a very specific form of strengthening (specificity of velocity, load and order of recruitment). This is why sprinting must be the primary source of work in a hamstring rehabilitation program. It is not a problem that can be adequately resolved in the weight room or physio clinic. The acceleration repetition in the video clip below shows the athlete not only running faster, but striding through more naturally, with much less apprehension than the previous week. If you look very closely, you can see that the left leg is still not extending as it normally would. Prior to ground contact, you can see the stride shortening on the left side, whereas the right foot extends and lands slightly in front of the center of mass. Similarly, on the extension phase of the stride, the left leg is shortening the cycle ever so slightly and not extending as fully as the right leg. The result is a slight anomaly in the stride cycle that you can pick up through a visual sampling of the entire 20 meter run. Feedback from the athlete revealed that he felt only a slight, subtle stiffness in an isolated area of the hamstring, but not any pain or discomfort. By this time in the rehabilitation process we were beginning to work deeper into the tissue with massage techniques to break up and mobilize any scarring in the area. It is important to remember that we were not constrained by a short timeline and we had enough time to gradually effect a positive result. I was determined to make sure that when the athlete was ready to push at 100%, there would be no doubt in my mind or his mind that the hamstring would be ready to handle the load over many repetitions. 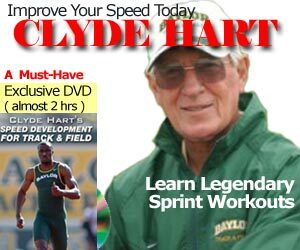 This meant that the sprint workouts were drawn out gradually in terms of adding both distance and intensity for the runs. The same approach applied to manual therapy on the hamstring. We did not force the issue with deep tissue massage until I was sure that the muscle tone had appropriately been reduced through a gradual means. In some sense, we had to “peel the layers of the onion” until the whole of the muscle had been stripped of spasticity and discomfort. One measure that always seems to work well with muscles that have not fully “released” or joints that still feel tight is to have the athlete apply a heat rub on the injury in the evening and then lightly wrap it with a tensor bandage. The athlete then sleeps with the light wrapping. This basically enhances blood flow to and through the injury site. I always use Tiger Balm ointment for this process, as I’ve had very good personal success with it. It does, however, smell pretty bad and I recommend showering it off in the morning. This process is akin to the wrapping of the legs of thoroughbred horses after intense workouts and when a trainer suspects there may be a slight strain or sprain. In the case of horses, they may refer to wrapping of the legs as stable bandages or sweat wraps. So the first 8-10 days of rehabilitation went very smoothly with no mistakes on my part. I have learned over the years to be extremely explicit in my descriptions of intensity and velocity to the athlete when preparing him for runs. I would say that I significantly overstate the need to be cautious in each individual run. I have had too many occasions when the athlete told me that he was feeling good and then proceeded to push it a little too hard on the very next repetition, resulting in a minor re-strain of the muscle. Placing significant restrictions on the athlete is critical, regardless of how good or normal they feel. The coach is always the best judge of the rate of progression, whether it is through visual assessment, tactile sensation of the muscle itself or even something as simple as the amount of time that has passed. The progression must always be smooth and gradual. In Part 3 of this discussion of hamstring rehabilitation, I will discuss how we progressed the athlete to full speed runs. We will also cover the other types of work that were being done in the weight room and with explosive work, taking into consideration the status of the hamstring and the stage of rehabilitation.